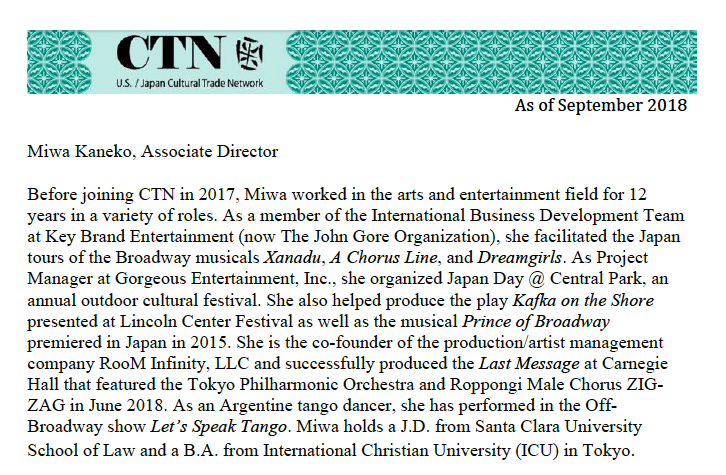 The U.S./Japan Cultural Trade Network (CTN) was founded as an international project of Arts Midwest, headquartered in Minneapolis, MN in 2001 to provide leadership, vision, information and support to enhance cultural trade between the U.S. and Japan. 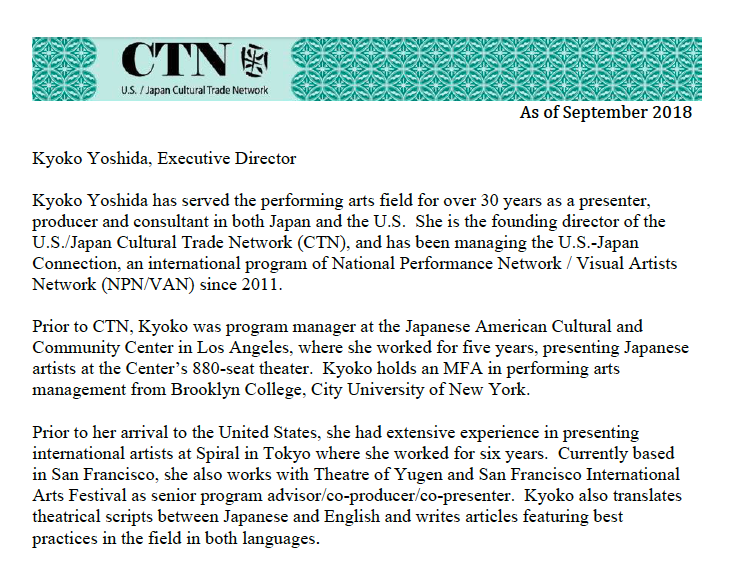 Under the leadership of its founding director, Kyoko Yoshida, CTN has designed and implemented a number of exemplary exchange projects (or more than a dozen co-productions) with an array of committed partners and participants, developed long-term relationships and broadened the knowledge within the professional community about artistic resources and practices in both countries. After its successful and productive operation of five years in the Midwest, CTN moved to the Pacific-rim city of San Francisco in 2006 to become an independent nonprofit organization. Design and deliver exemplary arts and cultural exchange programs in the U.S. and Japan. Build and share broad knowledge within the professional community about artistic resources and management practices in the U.S. and Japan. Facilitate strong working relationships between and among artistic professionals in the U.S. and Japan that will support productive exchanges. Provide access to contextual understanding for the artistic work that is being created and/or exchanged. Provide culturally-competent translations, bi-cultural facilitations and coordination services to enable cross cultural projects to fulfill their potential. · Organizing seminars and briefing sessions on Japanese performing arts at national and regional booking conferences in the U.S. in association with The Japan Foundation. The conferences have included the annual meeting of the Association of Performing Arts Presenters, Midwest Arts Conference and Performing Arts Exchange. · Facilitating a number of genre-specific Japanese field expert research trips to the U.S. including participation at the National Dance Project meeting in Honolulu, and a dance research trip to Philadelphia. Other field sites have included Minneapolis, New York City, Columbus, Milwaukee, San Francisco, Charlotte, and Kansas City. · More than 40 delegation trips by American arts professionals to Japan and by their Japanese counterparts to the U.S. To date, we have brought over 100 performing and visual arts professionals from the U.S. to Japan to participate in international conferences, visit their counterparts on site and meet with possible funders. · “American Contemporary Plays and Playwrights Series” at The Tokyo International Arts Festival in partnership with Arts Network Japan and The Playwrights Center (PWC) between February 2006 and March 2008. · “Japan - U.S. Contemporary Plays and Playwrights Exchange” in association with The Saison Foundation and The Playwrights’ Center since July 2006. · Rennie Harris Puremovement (Philadelphia, PA), hoi polloi (Boston, MA), Shawn McConneloug and her Orchestra (Minneapolis, MN) Live Dance Showcase (Japan Premiere) at TPAM 2003, and related residencies at Kanazawa Dance Week in December 2003. · “Note–Memory Fades,” a collaborative dance piece by Attack Theatre (Pittsburgh) and Nibroll (Tokyo). World premiere in March 2003 in Tokyo and U.S. tour in fall 2003. · Long term Residency Project of Eitetsu Hayashi, a taiko master artist, in Columbus, Dublin, and Cleveland Ohio in association with Ohio Arts Council (January 2003 – May 2006). · “Crazy Cloud Collection,” a collaborative performance piece by Shinichi Iova-Koga + inkBoat (San Francisco) and Ko Murobushi (Tokyo), in association with San Francisco International Arts Festival and inkBoat, premiered in May 2010, toured to four four cities in the U.S. in 2012. · Conceived and co-produced “Crazy for Words” an educational residency program with Theatre of Yugen and Rosa Parks Elementary School JBBP in 2015 and 2016. · Cultural facilitator for such projects as VISTA 360’s Jackson Hole Fire Festival as part of the Mt. Fuji – Grand Teton/Yellowstone Partnership. As part of VISTA 360’s effort to connect the mountain regions and communities of the world, CTN facilitated and contextualized the 600-year old tradition of the Fujiyoshida Fire Festival and helped transplant it in Jackson, WY. · Co-organized and supported creative residencies and presentations by Allison Orr, Nora Chipaumire, and Darrell Jones in Kyoto and Kobe, Japan; and KAORI SEKI CO. PUNCTUMUN’s creative residencies and tour in the U.S. as part of NPN/VAN’s U.S.-Japan Connection. The U.S. Founding Partners of CTN are Arts Midwest, National Dance Project of New England Foundation for the Arts and Pennsylvania Council on the Arts. CTN Partnering Organizations also include Ohio Arts Council, Embassy of the United States of America, Nagoya American Center and The Playwrights Center. Japanese supporting organizations include The Japan Foundation, The Japan Foundation for Regional Art-Activities (“Chiikisozo”), Tokyo Performing Arts Market, Tokyo International Arts Festival, Osaka 21st Century Association and the Performing Arts Messe Osaka and Japan Contemporary Dance Network.